Jeannette “Jean” Hoffman was born on November 29, 1951, in Cincinnati, Ohio. She is one of four children, along with a twin sister and two older brothers, born to Gus and Jeannette Hoffman. Jean spent her early years on the family farm in Clermont County where her father operated a savings and loan and also owned a sprint car racing team. While her family had a history supporting the Democratic Party, Jean identified strongly with Republican arguments made by candidate Richard Nixon during the 1960 presidential debates.2 She earned a B.A. in political science from the University of Cincinnati in Cincinnati, Ohio, in 1974. After Schmidt was sworn in to the 109th Congress (2005–2007), on September 6, 2005, she received assignments on the Agriculture, Government Reform, and Transportation and Infrastructure Committees. Schmidt remained on the Agriculture and the Transportation and Infrastructure Committees throughout her tenure as a Representative, but left the Committee on Government Reform after her initial term ended. She was later appointed to the Committee on Foreign Affairs in the 112th Congress (2011–2013). Her legislative agenda and voting record closely resembled her predecessor Rob Portman’s, though Schmidt also emphasized anti-abortion legislation. She captivated the national press during her truncated first term during a controversial speech on the House Floor defending the Iraq War. Schmidt swiftly asked that her words be withdrawn from the Congressional Record, but reaction was loud and polarized. Ultimately, Schmidt embraced the characterization of toughness her supporters thrust upon her, “You have to be in this environment. Politics is not for the faint of heart.”9 She utilized her elevated profile to further pro-life bills. In 2012, Schmidt again faced a strong primary challenger: Brad Wenstrup, a small business owner and former combat surgeon. He specifically singled out her votes to raise the debt ceiling and had the backing of a powerful anti-incumbent political action committee which espoused no specific partisan viewpoint but operated solely to “make the electoral system competitive.”16 Wenstrup did not run a single television ad, and Schmidt spent the day before the primary attending a House Republican Conference meeting and casting votes on the House Floor.17 Wenstrup prevailed with 49 to 43 percent of the vote and went on to win the general election. 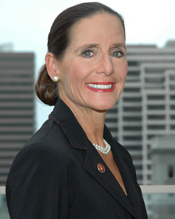 Schmidt completed her term on January 3, 2013, and returned to her district. 1Howard Wilkinson, “A Pair of Fighters,” 24 July 2005, The Cincinnati Enquirer: E1. 2Politics in America, 2012 (Washington, D.C.: CQ Press, 2011): 762. 3Erin Mershon, “Schmidt Finds Strength in Running,” 25 April 2011, Roll Call: n.p; “About Congresswoman Jean Schmidt,” Congresswoman Jean Schmidt, n.d., http://schmidt.house.gov/about-me/full-biography (accessed 12 December 2012). 5Politics in America, 2012: 761. 7Jack Torry, “DeWine No Shoo-in to Fill House Seat,” 11 June 2005, The Columbus Dispatch: A3; Gregory L. Giroux, “Schmidt Beats Bigger-Name Candidates With Decisive Win in Ohio GOP Primary,” 14 June 2005, Congressional Quarterly Today: n.p. 8Lauren W. Whittington, “A Politician Used to Grueling Runs,” 8 August 2005, Roll Call: n.p. 9Politics in America, 2008 (Washington, D.C.: CQ Press, 2007): 784–785. 10“Election Statistics, 1920 to Present,” http://history.house.gov/Institution/Election-Statistics/Election-Statistics/. 11“For the U.S. House,” 29 October 2006, The Cincinnati Enquirer: E1. 12Ben Fischer, “Schmidt's Win Leaves Democrats in Shock,” 8 November 2008, The Cincinnati Enquirer: A1. 13Politics in America, 2012: 761. 15“Court Ruling Doesn’t Mean Obamacare is a Good Idea,” 29 June 2012, Office of Representative Jean Schmidt. 16Paul Kane, “One Super PAC Takes Aim at Incumbents of Any Party,” 7 March 2012, Washington Post, http://www.washingtonpost.com/politics/one-super-pac-takes-aim-at-incumbents-of-any-party/2012/03/07/gIQAhOfwxR_story.html (accessed 9 October 2012). 17Chris Cillizza, “Who Had the Worst Week in Washington? Rep. Jean Schmidt (R-Ohio),” 9 March 2012, Washington Post, http://articles.washingtonpost.com/2012-03-09/opinions/35446719_1_jean-schmidt-worst-week-special-election (accessed 9 October 2012). "Jean Schmidt" in Women in Congress, 1917-2006. Prepared under the direction of the Committee on House Administration by the Office of History & Preservation, U. S. House of Representatives. Washington: Government Printing Office, 2006.